On windows Server 2012, Centralized SSL Certificate Support has been introduced in IIS8. This feature allows certificates to be stored in a central location like a file share. Once it is installed, you can view the feature in IIS. 1. On the server, open IIS. 2. Go to server name and under the Management section, double click the option of "Centralized Certificates"
From the Actions section, click Edit Feature Settings. 1. Enable the option of "Enable Centralized Certificates"
2. Physical path: This is UNC path to the file share where the certificates are located. 3. User name: Mention user account that has read access to the file share. If your certificates don't have the password then leave it empty. If your certificates have password then enter the password here. Now, the feature of "Centralized SSL Certificate Support" is ready to be used. Thank you so much for sharing such wonderful information on IIS 8: Centralized SSL Certificate Support. I am a bit IIS novice and I would like to know if there is any option in IIS that will tell me which site consuming high amount of RAM and CPU? Through Plesk panel I can monitor those things, but I am curious to know whether such kind of option or module available in IIS. Yes, you can monitor the CPU & other resource usages directly from IIS. 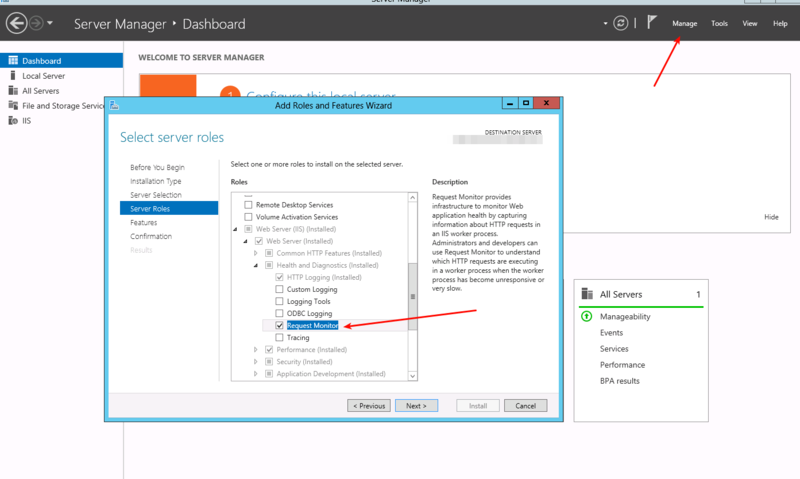 Server Manager -> Add Roles -> Web Server (IIS) -> Web Server -> Health and Diagnostics -> Request Monitor. Once this is done, Launch IIS GUI/msc & there you'd be able to monitor the desired resources..